The Huanuo HDNSK2 offers fully adjustable gas-spring monitor mounts for small to large displays at a very wallet-friendly price. The device should help multimonitor users organize an otherwise messy desk to create an aesthetically pleasing yet functional setup. The Huanuo HDNSK2 costs considerably less than its closest competitors, but does it have the quality that will satisfy meticulous users? 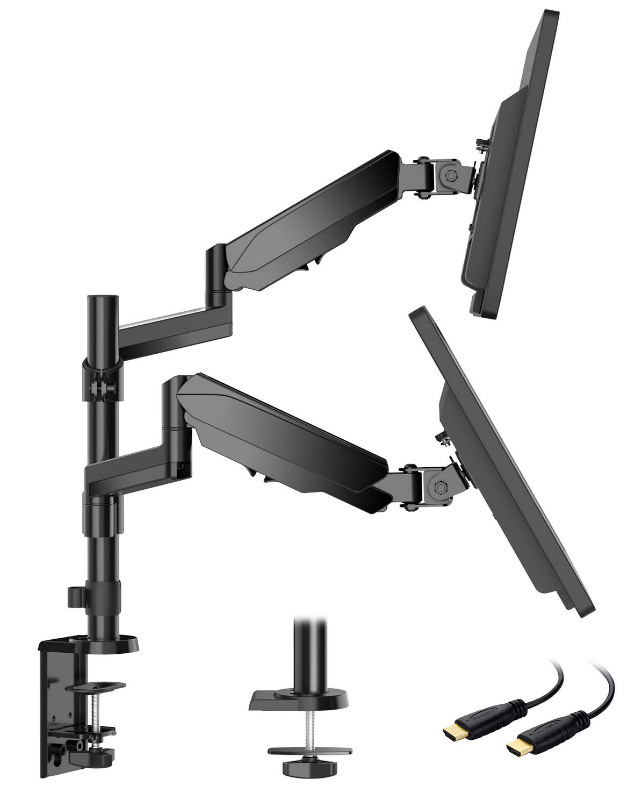 The Huanuo HNDSK2 features a solution for dual monitors in the form of gas spring-equipped arms which have a metal frame with a black coating for stain resistance. This product looks simpler than the Techorbits option we reviewed earlier, but looks matter less when it comes to functional add-ons such as this one. Build quality is good despite the product’s bias towards affordability, and each part looks like it was cut or formed with precision. The first thing we noticed once we opened the Huanuo HNDSK2’s packaging is it ships almost fully disassembled. The device requires a bit of elbow grease before you can utilize it, potentially turning off some users. There are several loose parts and the instructions aren’t the clearest we’ve come across, so taking time to put it together is a necessity. 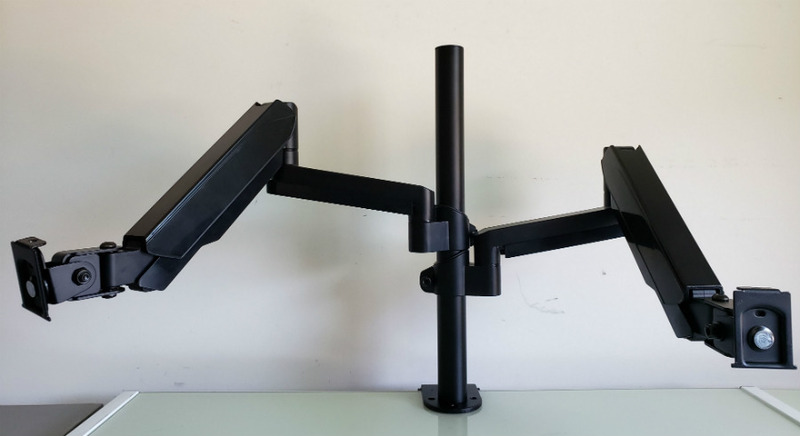 The Huanuo HNDSK2 provides two options for mounting to a desk so it should cover most, if not all of the desks sold by your favorite office supplies store. The C clamp method requires a backless desk with a maximum tabletop thickness of 3.1 inches. On the other hand, the grommet method requires a hole and a tabletop surface not thicker than 1.6 inches. Both fixing methods work well to keep the whole package upright as long as your desk fits the required thicknesses adequately. However, we noticed that it’s quite difficult to turn the locking screw for the C-clamp, but it’s all good since it means the lock won’t magically undo itself with minor movement. The gadget includes two fully removable monitor arms with 360 degrees of rotation each and a 180-degree total of swivel. Each of the VESA mounts supports 75 x 75 and 100 x 100 bolt patterns while enabling users to utilize 35 degrees of tilt both ways. The arm’s placement on the arms are offset on top of each other, so stacking two displays is possible. The arms for the Huanuo HNDSK2 also include cable clips to keep your setup neat and clutter-free. Make sure to alot a bit of allowance for the wires before locking them in if you plan to move the screens around since they can get caught on the joints. The Huanuo HNDSK2 holds 17-inch to 32-inch monitors as mentioned, except for stacked arrangements which will limit the size accommodation to 27 inches. 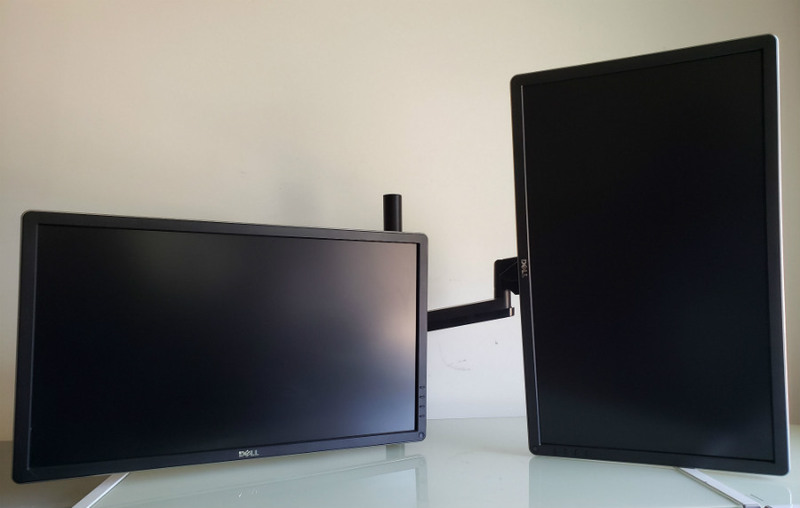 The VESA mounts locks into monitors sufficiently, so your displays won’t just snap off with normal use. The device is also lighter and more compact than most competitors, so storage shouldn’t be an issue. However, the biggest flaw of the Huanuo HNDSK2 is its gas springs which we found to be a bit too weak for the monitors in the pictures. It’s difficult to keep a complex position since the arms tend to swing and dip if you keep the displays at a high angle. 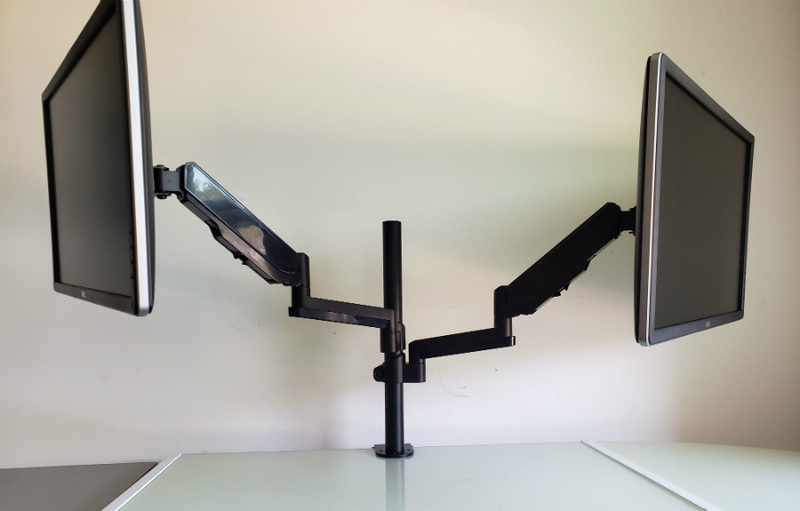 The best way to utilize this device is to find an agreeable view angle, then tighten the joint closest to the monitor chassis as much as you can. But after everything, the Huanuo HNDSK2 does provide an excellent range of adjustments for most users. We don’t recommend it for the larger displays, but it works great with 24-inch and below models which are light enough. Being able to tilt your display by 35 degrees in both directions is fantastic for getting the perfect view angle, while the arm’s articulation takes care of flexibility in creating a desktop setup. The Huanuo HNDSK2 is a decent dual monitor solution if you have smaller displays and a limited budget. The product’s construction quality is great for the price, but it could use some improvements in its joints for more firmness. Movements are smooth and easy to manipulate, but the stability of the displays, when set to a desired position, matters more than anything. The Huanuo HNDSK2 isn’t as aesthetically appealing as the Technorbits Dual Monitor Mount, but that’s something we’re willing to forgive because of the price. This model is at least forty bucks cheaper, after all. Note: You can use the promo code 3HCUY2MV for the Huanuo HNDSK2 at checkout to bring the already low price to $47.49 if you hurry!